My boyfriend has just ordered me to stop hugging my book. So now I'm writing a review instead. Of course I love, adore and worship this book. How could I not? Gaiman both mentions Disney World and Jane Austen, and he creates a mythical parallelworld filled with absurd and whimsical characters, who are both fantastical and believable. The story, the writing, the setting, the characters, the combination of realism and fantasy are so well-crafted, that I have no other option than to reward the book with five stars and shelve it among my favorite books. The premise of the story, the creation of Londow Below as a contrast to London Above is so original and extremely detailed. The underlying message of how much people tend to close their eyes when looking at the poor, the homeless and the helpless - ultimately making them invisible, is such a genuine observation. Gaiman seems to be celebrating the outcasts of society, and London Below is overpopulated with hopelessly naive and fearful individuals, trying to find their way in their own reality. Richard Mayhew's loss of a job, an apartment and his girlfriend shows just how fast you can lose your entire identity in our modern society. Without these things he simply ceases to exist. And the characters! So comical, disturbing, magical, endearing and interesting. Mr. Croup and Mr. Vandemar may just be the best villains ever; their delight in murder and torture and their strange conversations are equally creepy and absurdly funny. Lady Door is interesting and heartwarming; while Hunter is distanced, detached and cold. Marquis de Carabas almost resembles Rumplestiltskin with all his sneaky tricks and complicated deals. Angel Islington is also a perfect proof of just how dangerous real power can be; and how you should always beware of false appearances. All the characters have their own individual voice, their own unique way of speaking, acting and reasoning. They all have a different life philosophy, a different quest and a different goal; and they all unite in a colorful explosion of betrayal, trust, friendship, deals and revenge. 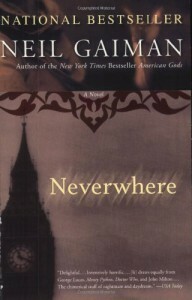 Perhaps "Neverwhere" could be interpreted as an insightful exploration of people's differences and interactions. Richard Mayhew himself takes an incredible journey throughout the book. He starts as an unlikeable and trivial person chasing after a blurry dream of an 'ordinary life', and ends up as a courageous hero, a victor and a compassionate friend. As the book lacks towards the ending, he realizes his dream may not be so golden after all; he slowly changes and evolves. He discovers that his identity doesn't need to be defined by his apartment, his job or his girlfriend. He discovers who he is at the core of his being. This is a wonderful book; it will transport you to a surreal, and yet completely real, world with bizarre, and yet lovable, characters. The writing will slowly cast a spell on you; and you will fall in love with Gaiman's writing. It is inevitable, unavoidable.